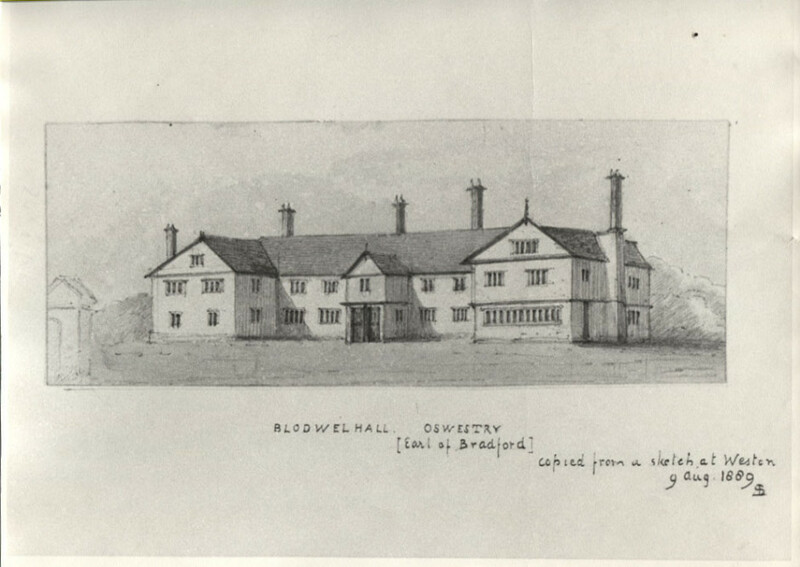 This is a sketch, copied from a sketch in the corner of a map, at Weston, of the old hall of the family of Mathews of Blodwel. The estates of the Mathewes’ and the Tanats’ both of Blodwel, were united by the marriage, in the early part of the 17th. century,of John Mathews and Jane Tanat. Ursula Mathews carried the estate into the family of Bridgeman, by her marriage with Sir John Bridgeman Bt. (who died in 1747) grand-son of Ld. Keeper Sir Orlando Bridgenan, who had himself acquired the neighbouring estate of Moreton, about 1640, by his marriage with Judith, d. &, h. of John Kynaston. He, or his father, purchased Castle Bromwich, an old seat of the Devereux family. Nothing now resins cf the hall represented in the sketch.